MUFF WIGGLER :: View topic - Telephone GAME QUICK START GUIDE!! read! Telephone GAME QUICK START GUIDE!! read! honestly if you just patch it up like a regular sample and hold U ARE MISSING OUT! now you plug the telephone games CV outs into those VCOS you set up! all cv outs are fair game. note...sum out sounds VERY VERY different depending on how high feedback is up, AND how fast your clock is AND what mode (a or B) you are in AND how long of an envelope you use with your vca...too short and u wont hear trills! slew adds slew to either stage five out OR the output of the morph wave shaper. so u could use this AS your 5 out with the option to mess with portamento OR use it together with 5 out ( going into 2 different vcos ) with one with a lot of slew to get weird stereo or contrapuntal effects!!
. simply select source, plug into slew out and mess with slew knob. slew is at zero intensity all the way to the left . with chaos at max and speed quite low, the chaos bro will help the tel game spit out endless variation!!
" line" /cv out, you can only control feedback of every stage, feedback of the last stage. and u can cut out the input for a moment and have the output be the only input. its really no different than setting up 4 voices to be driven by a sequencer. except you only need a gate sequencer or clock divider driven by the telephone game clk out to drive everything. you dont need individual tracks for your parts. this may sound odd or like letting the module have too much say in your music, but thats sort of the point. its not all you, its not all the machine. you work together. and if u can feed the machine chaos all the better!!! perfect description and teasing ! here is a useful step by step cheatsheet:TELEPHONE GAME---CHEAT Sheet!!! 2.put a signal into the signal input....chaos works reallllllly well!!!! as does the built in (normalled) white noise. turn signal input to about 80-90 percent to start. AND TURN ALL FEEDBACK POTS TO ZERO....SLEW KNOB TO ZERO. ...sending telephone game cv outs to your destinations.... dont use just one or two!! the real fun starts when you get an orchestra of weird stuff going!! take a CV out maybe start by using number five ....then you can play with attenuverter/level on the CV out.... keep plugging outputs into destinations! use at least 3 outs!!! DONT FORGET TO SET 5/SUM ATTENUVERTERS TO THE LEFT OR RIGHT-----MIDDLE EQUALS ZERO OR NO SIGNAL!!!!!!! then once you have plugged a few cv outs (i usually take the 1 out for melody, 5 out for bass, sum out for lead, the slew out(morph) to cv cutoff filter control (as you turn slew to right, cutoff will change) maybe #3 out for another parameter like delay time, vca level offset, chaos cv, etc, and 2 out can control yet another vco OR use it as a free jack to patch in and out of stuff while you build your set, and obviously white noise out for noise! and remember....you are going to put these destinations through VCAS in a later step. you will then gate and ungate them using a divider or gate sequencer which is LOCKED to the telephone game. so in this sense the Telephone Game is a CV ONLY sequencer. it is not a gate sequencer. so once you get all your pitch and modulation cvs setup, you will want to get a bunch of gates going ( locked to the clk out of the telephone game) to trigger envelopes, vcas, etc. PATCH IDEA NOTE: for feedback fun...try taking an unused CV out like 2 or 3 and plugging it INTO your source CLOCK or source SIGNAL cv in!!! if you are using the chaos brother OR Dreamboat as your signal SOURCE ( both excel in the role of providing raw material to the telephone game) simply plug into the CV INPUT and experiment with how much to feedback!!! there are a few approaches...the easiest and least module intensive is simply using a multiple out/multiple division clock divider ( the 4ms QCD IS SO GOOD FOR THIS!!) to take the telephone games clock out and make 4 trigger signals out of it....this would allow for driving 4 envelopes/vcas or at least 4 vcas!! Another easy method a single gate sequencer ( pamelas workout, or many other gate sequencers are available) and using those gates to trigger envelopes which trigger vcas. depending on the vca, a gate on its own may suffice. ( some modules have built in vcas of some sort...for example the make noise DPO has a "strike" inout which allows a gate/trigger to open up the vco without any external vca or envelope. if only life were always that easy!!!! A: drive a clck divider -----take the divisions out to trigger multiple envelopes (which ipen/close the vcos you just modulated with the TEL GAME OUts....this is key!!! B: drive a gate sequencer!! like all snazzy fx modules' this was made to be very flexible. if you flip clk out all the way to the left its super fast!! this is great for times where you want the telephone game to have rapidly triggering envelopes. in the middle, the clk out will drive your gates at a much slower pace....usually better for times when you want the voltages to be held longer, creating more of an effect. always try clk mode B FIRST!!! but remember the default setting is to have none of the loop LEDs turned on!!!! if you start with Loop turned on you're going to be looping nothing!! in other words you always have to make sure you have your signal gain turned up ! simply have extra tracks on your gate sequencer driving them...your master clock will drive the telephone game and then that will drive your sequencer. if you used 3 or 4 cv outs to drive melodic vcos' then you also have a bass, and some other patterns. you can mess with the feedback knobs to get things changing. Please explain what exactly happens at the input. I am still very unclear on this. looking forward to a complete manual - when is that coming? I just picked this module up and am scratching my head a bit. changing the input gain effects everything!! automatically routed to the input! Okay, thanks, I will go with that. loss1234 sent me this latter writeup by email in response to my request for a manual. I pointed out to him that the text refers to features of the panel that don't seem to be there (CV Out 2. Can anyone find CV Out 2?) and that others are referred to inconsistently and confusingly (the 3-position switch labeled 'CLOCK [divide sign]' in particular. I suggested that he try to clean up this applications-oriented text and add a reference section consisting of a 'ma'p of the panel features with a short description of each function and also a system block diagram. I think that would pretty well do it. Let's hope for the best. Meanwhile I'll try to post as I sort out the functions of the beasty by reading, watching vids, and experimentation. Cool module. I agree - I got the same writeup. At least a diagram with general description of what each input/output does would be helpful. Any update on the graphic that explains the ins and outs? Thanks! Yes, it sounds very interesting, but I'm not grasping what it's doing yet. Will there be a document that starts back a step or two so we can get oriented? Hoping for an update on this - or maybe someone else can chime in and give a good overview/explanation. +1 as mine is incoming tomorrow!!! This is the problem with these dedicated sub forums and manufacturers that don't visit often to tend to questions. If this were posted in the euro forum ther would probably be some good activity on it. 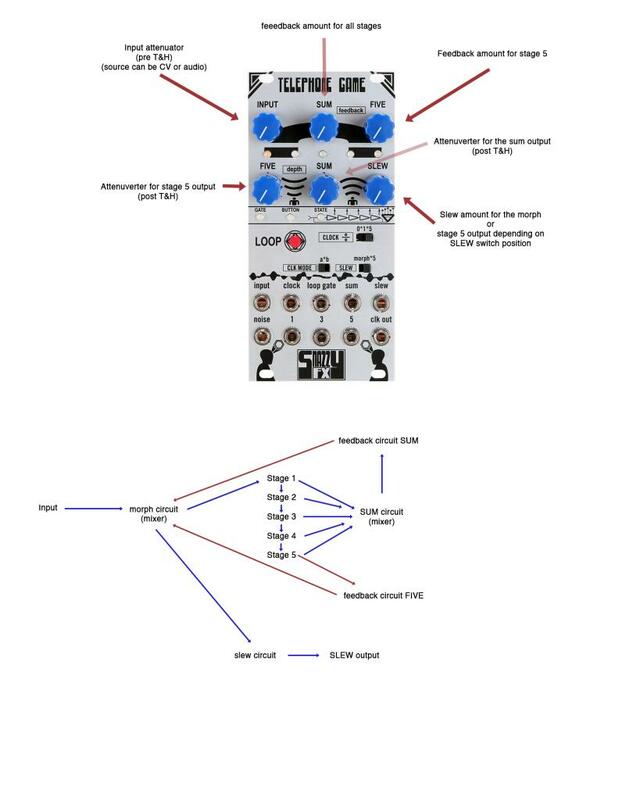 I asked about getting a basic description of each knob's and jack's function but didn't get a reply other than what has been posted here. Sort of bums me out. I have had a bit of communication with Dan. I think a more comprehensive manual is coming soon. Thanks, that should help prospects visualize the basic flow. Is a legitimate manual planned?